The history of 20th-century Iran is brimming with fascinating, complex tales of personal and social travails and triumph. The country went through name changes, revolutions, several dynasties, countless heads of state, and the Islamicization of the government after 2,500 years of monarchic rule. This tumultuous atmosphere and the continual shift in powers that presided over the distribution and exhibition of art had a double-edged effect on Iranian artists: the turbulent environment cultivated intelligent and dissenting voices, and hindered their freedom all the same. Many chose to reform themselves, whereas others were forced into exile. 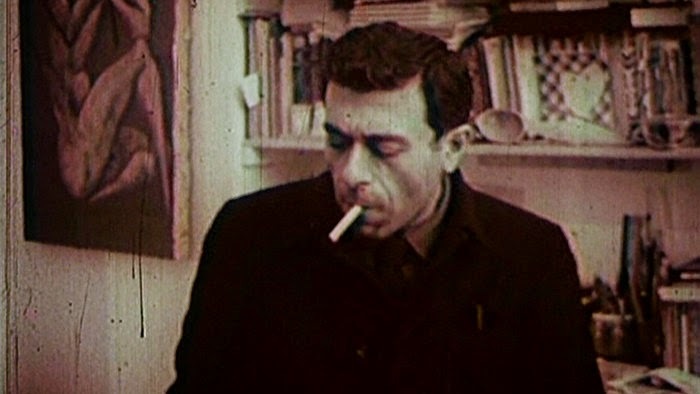 Bahman Mohasses, the subject of Mitra Farahani’s stellar new documentary, Fifi Howls From Happiness, chose something in between. Born in the north of Iran, Mohasses was a painter, sculptor, and translator whose avant-garde works gained him his “Persian Picasso” moniker. He was an eccentric figure, befriending oppositional artists and the royal family at once. He traveled between Italy and Iran, and felt unsettled at either home. He was a fish out of water, as many of his pieces and the film’s opening allegorically suggest. His work – much of it now destroyed either by the Islamic regime or by him– remained consistently powerful and subversive, and Mohasses was as restless and vibrant as ever even in his final days. Yet he became something of an enigma, living in total anonymity in Rome, even thought to be deceased by some. Director Mitra Farahani is herself a similarly curious figure in a more modern mold. A successful filmmaker and painter who resides in Paris, she has made films like Just a Woman – winner of the Teddy prize at Berlinale – and Tabous, Zohre and Manouchehr, films that deal with sexuality in ways unfamiliar to Iranian audiences, making the latter something of a cult hit. In that light, this is the perfect marriage between the filmmaker and her subject. Farahani doesn’t explain how she first found Mohasses, shrouding his figure in even cloudier mystery. She is nevertheless granted access to his living space, a small hotel room in Rome, decorated with a variety of his art works. But the small space is no obstacle for the film’s edgy energy. Mohasses notes at one point that “a painting is a confined space, but reflects the infinite with limited tools.” The same can be said of Fifi Howls From Happiness. Incorporating the abrupt shifts in mood and tone and the jittery nature of Mohasses’s storytelling to dictate the pace of her film, Farahani bursts onto the screen with a creative force as powerful as that of the painter’s most outrageous works. Her editing and vivid use of music is unexpected, but invests the film with an unpredictable rhythm that completely absorbs the audience. In the process, Farahani proves herself to be equally worthy of the camera’s attention, despite appearing in front of it only briefly. She forms a master-and-disciple relationship with the old man and follows his specific advice about the beginning and ending sequences of her film, the intertitles and the inclusion and exclusion of certain art pieces. Yet she never loses her authorial voice. She shrewdly controls the film, at times holding back her comments to let Mohasses speak for himself; other times, going so far as to reshape her gesture to evoke certain answers from her muse. They feed off one another’s energy. Farahani introduces us to a different facet of Mohasses’s character as a negotiator and businessman – significant in his interactions with government authority in the past – when she helps two art collectors connect with Mohasses about purchasing his remaining work and commissioning a new one. Although the dynamic of their conversations is interesting, Mohasses needs neither the added drama of new patrons nor Farahani’s aiding hand to entertain the audience. His wild political ideologies, unashamedly vulgar vocabulary, and curious opinions about his homosexuality – strongly influenced by Iranian poetry – mesmerize the audience. Nowhere is this funnier or more illustrative of the man’s strange sense of humor than when he spouts excessive profanity to describe the beauty of Iranian actress Golshifteh Farahani. Still, the film is as much about him as it is about the woman behind the camera. Fifi Howls From Happiness, named after one of Mohasses’ paintings, gradually becomes a rich dialogue between two artists, rather than a biography of the exiled provocateur. Farahani doesn’t paint a hagiographic portrait of the man; rather, she captures the complexity of his character by engaging in a process of conversation with him that is as cathartic for her as it is illuminating for us. From the allegorical opening to the film’s shocking, painful, but expected end, Farahani exposes as much of herself as she does of him; she’s no less fascinating a subject.